Intriguing, on going story on Uranium in Vietnam beginning from the War. In 1996 I met an old British/Australian man (80+ years old at that time) in Melbourne. He asked me if I knew what caused American involvement in Vietnam war. My conventional answers were given, but he said they are all incorrect. He said the real reason was Uranium deposits in Vietnam! I replied that I had heard of that rumour since 1960 in Vietnam but there was little reason to trust it and I thought that it was only from an anti-American misinformation campaign. He then said that he was working for BP after WW2 and was the man in charge of prospecting for Uranium in Vietnam. He said that because of Uranium, the French got American to join their side in the French Colonial war. 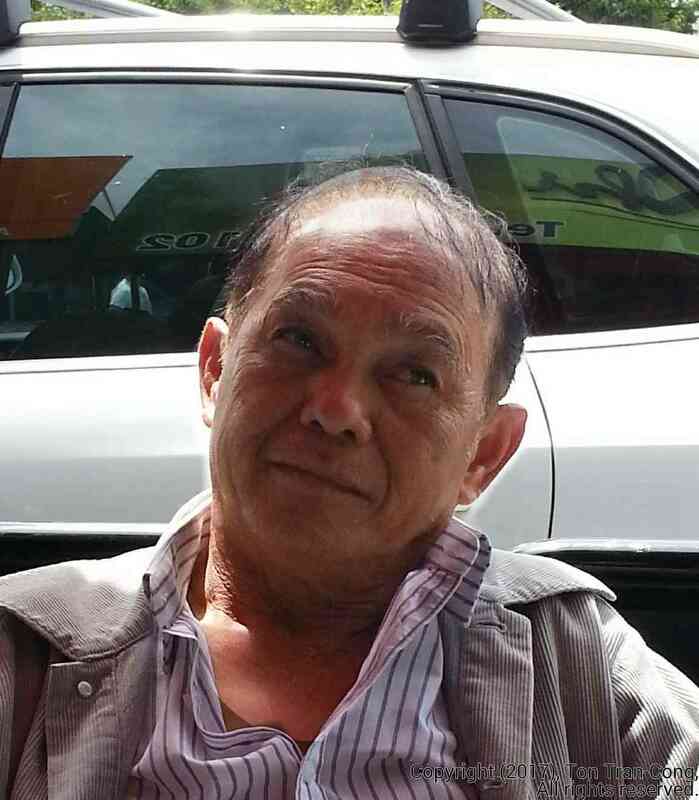 He said that his mission after WW2 in Vietnam was called off when he received a telegram saying that the mission was terminated because of the discovery of a huge deposit of Uranium in Australia. 1. British Petroleum had been in the business of prospecting for Uranium. 2. The year of his termination of the mission does fit in nicely with the official declaration of the discovery of huge Uranium deposits in Australia. 3. In 1990 to 1992, the Department of Natural Resources of Socialist Republic of Vietnam declared that Vietnam has a HUGE Uranium deposit. They are low grade, concentrating in many areas, including in Nong Son (where low grade coal had been mined by Republic of (South) Vietnam. The Socialist Republic of Vietnam had later commissioned a Canadian Uranium mining company to assess the ore deposits. 1. The declaration in 1990 (from 1990 to 1994, the exact date I can’t remember) by SRV that it has huge amount of Uranium ore.
2. Currently there is a non-transparent, military styled, uneconomical mining of (rumored to be) BLACK bauxite (bauxite is usually yellow brown or tan, China has been buying bauxite from Australia at dirt cheap price) by Chinese operator in Lâm Đồng area in VN (going through the purpose built Kê Gà sea port and its purpose built routes) and the Vietnamese government currently does not have any mention of its past declaration of huge Uranium deposits. (There may be a secret cooperation between USA and China to quietly take all Uranium deposits out of Vietnam without any approval by Vietnamese people, who are the ultimate owners of territorial minerals). 3. American have brought into Vietnam many Geiger counters prior to 1974. What are they for unless they are used for prospecting or for picking up equipment associated with Nuclear weapon? 4. Before the Vietnam war ended on 30th April 1975. American personals had already removed their Uranium bars at the Research Nuclear Reactor in Dalat built by USA (for its former ally Republic of Vietnam, as an example of unreserved commitment to the future of RVN). However, USA tried its best to persuade SRV to have permission for coming back to Dalat to look for any misplaced Uranium bars ! How could it happen and who had been responsible for such a sloppy accounting procedures of Uranium bars? Anyway, the SRV agreed to let USA come back to the reactor to search for their misplaced Uranium bars but nothing was found. As a result of that cooperation, there was relaxation on the embargo by the US against SRV (The real reason may be to check if SRV has fed any of its own Uranium into the Nuclear Reactor). 5. Later on, there was a rare cooperation in Vietnam between USA and Russia to convert the Dalat Nuclear Reactor into a new type using lower-enriched Uranium and to arrange for a shipment of some spent Uranium out of Vietnam. As a result of that cooperation, Vietnam was given a time limited committee position on a UN Nuclear Commission and the US embargo against SRV was dismantled. 6. USA has shown the World that it could fabricate a cause for war against any middle country such as Iraq and to attack. SRV had done well to comply with the requests from USA. 7. There is currently an unusual freezing of relationship between two comrade in arms Socialist Republic of Vietnam and North Korea. It was NK who sent its best MIG fighter ace pilots to help North VN during the Vietnam war, some of its fighters actually had Died In Action. Their remains had been placed in a Temple for North Korean Heroic Fighters in North Vietnam but later quietly repatriated to NK around the year 2000. In contrast with China, NK had asked for neither territory nor payments for joining NVN in the war. There was no reason for such a freeze in the relation between two communist comrade countries. Is this unsual freeze part of an international plan to separate a Nuclear Capable State North Korea from an Uranium rich State Socialist Republic of VN? This is an unusual story but it brings up many hypotheses which can explain otherwise incomprehensible events. Soup of Parsnips and Tomatoes (Canh củ cải trẳng). This is a very simple, non-odoured, low priced soup dish that is also the base for making a variety of delicious, healthy Vietnamese and Cantonese dishes such as soup of pork legs (canh đùi heo), soup of pork ribs (canh sườn heo), soup of minced pork wrapped in Chinese cabbage and chives (canh cải Bẳc thảo dồn thịt), or soup of minced pork stuffed in chive strung tofu, (canh đậu hủ dồn thịt), soup of balls of minced fish (canh cá vò viên), soup of balls of smashed beef (thĩt bò vò viên), Cantonese rice noodle soup (Hủ tiểu). (Parsnip=Củ cải trẳng, Chinese cabbage= Cải Bẳc (Northern) thảo (vegetable); Chives= Hẹ). Chop a whole parsnip into small pieces of about 10g in weight each and boil it in a glass or ceramic cook pot until it becomes soft. Slice tomatoes into one eighth pieces and add to the broth and boils until tomato pieces also becomes soft as in the photo. You may add some chopped shallots, chopped spring onions and ground pepper to suite your taste. The soup is ready for serving. Glass or ceramic cook pots do not interfere with the taste of the soup. a. Parsnip plant (Pastinaca sativa) is a root vegetable closely related to the carrotand parsley. Parsnips are sold in supermarket as tubers. They look like washed carrots but they are white, about 20cm to 40cm long. Current price is $4.00 AUD ($3 USD) per Kg. Parsnip tubers had been used as a sweetener in Europe until replaced by beetroot and sugar-canes. They are rich in vitamins (C, E, B1, B6, B3, B5) and mineral metals (K, P, Mg, Ca, Na). Parsnips repel aphids, Western organic planters plant them among cabbage plants to repel aphids, using no insecticide but parsnips’ natural odour. Oriental (Eastern) herbalists claim that parsnips neutralize many toxic substances as well as render ineffective (proof ?) oriental oral medications. Herbalists’ wisdom advises against eating any parsnip together with pears, apple, grapes, medicines, ginseng, carrots (Rigorous proofs to claims are still not available). b. Tomatoes are sold in supermarkets. Current price is $3.00 AUD ($2 USD) per Kg. c. Shallots (Hành hương). Leeks (Hành Tây). d. Spring onion (hành lá). Chives (Hẹ). Touching parsnip then exposure of the skin to sunlight may cause skin rash. While the root of the parsnip is edible, the shoots and leaves of the plant have toxic sap containing furanocoumarins . Mono-sodium glutamate (MSG) imitates the taste of this soup. Unprofessional cooks using non-authentic recipes may put in a lot of mono-sodium glutamate to fool customers. Traditional, authentic recipes have no such modern ingredient. Soup with MSG is watery, with few parsnips and few tomatoes. Parsnips are not to be eaten while taking some herbal medications. a. Carrots. Carrots have many enzymes that quickly destroy any beneficial vitamin C from parsnips [3,4]. c. Pears, apples, grapes. Cyanogenic acid from parsnip may react (proof ?) with some compounds of in these fruits [3,4] to produce toxic chemicals. Vietnamese herbalists and media [3,4,5,6,7] claimed that prolonged consumption of these toxic chemicals can even cause (proof ?) lumps on the necks. d. “Wood ears” mushrooms (Auricularia auricula-judae). Eaters would have skin rash . 4. Where to find it? It is an inexpensive, common favorite dish (costing 10000VND =$0:50 US in 2017) in Vietnam (in Saigon). I don’t know how much it would cost in a Vietnamese restaurant outside Vietnam. Dueling by Tigers benefits the Hunter. Dueling by a Clamp and a Stork benefits the Fisherman. “Dueling by Tigers benefits the Hunter” means the fierce fighting between two tigers may make them both fall preys to their hunter. 1. The meaning and the actions. “Dueling by Tigers benefits the Hunter” (“Lưỡng Hổ Nan Tranh, Tiều Phu Đắc Lợi” in Vietnamese) means the fierce fighting between two tigers benefits their hunter . The dueling of two tigers is a rare event. Both of them would then be so exhausted that they both becomes easy preys to any lucky tiger hunter at the scene. When the quote entered the agriculture and fishery based Vietnamese culture it created a Vietnamese quote “Dueling by a Clamp and a Stork only benefits the Fisherman” . This quote means when a stork tries to peck the flesh out of a clamp, the Clamp may react by closing its strong half-shells to grip on the tips of the beak of the Stork making it stuck to the ground to be drowned at the next high tide. The fisherman only needs to first grab the stuck Stork then dig out the Clamp, if he so wishes.For the fisherman seeing a stork stuck with its beak stuck to the ground, he should catch it. He can also dig out the clamp if he does not need it to trap the next stork. The morality is that any two parties in any dispute have to know that their fierce fighting may make them both falling prey to some opportunistic third-party. (“Lưỡng Hổ” in old, Han derived, Vietnamese = two Tigers, Nan Tranh= hard fighting, Đắc Lợi = receiving the benefits, Tiều Phu = a person living off the forests). (Nghiêu Cò Tranh Nhau, Ngư Ông Đắc Lợi =Dueling by a Clamp and a Stork benefits the Fisherman). a. During the Three Kingdoms period in China (from the foundation of the state of Wei in AD 220 to the conquest of the state of Wu by the Jin dynasty in AD 280. ), there are three most powerful contenders to the supreme title [1, 2, 3]. They are Cao Wei (曹魏) State, Shu Han (蜀漢) State, and Dong (or Eastern) Wu (東吳) State. 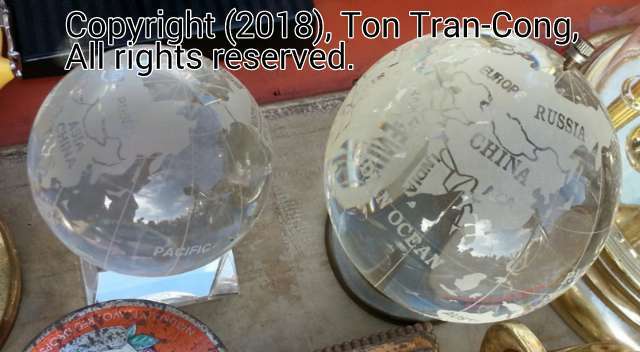 The two most powerful contenders are Northern Cao Wei State (Bắc Tào Ngụy với Tào Tháo in Vietnamese) and Eastern Dong Wu State (Đông Ngô với Tôn Quyền in Vietnamese), The weakest contender is Western Shu Han State (Tây Thục Hán với Lưu Bị, Khổng Minh, Quan Công, Trương Phi in Vietnamese). The two strongest contenders fought like Dueling Tigers while the third, weaker, Western Shu Han State only managed to prevent any of its more powerful neighbour states from being an outright winner. The weaker state played the role of the beneficiary Hunter. b. During the Northern Jin (1115–1234) – Southern Song (1127–1279) time in China , the two states fought fiercely like Two Dueling Tigers, their border was the Huai river. Then came the Mongols, led by Genghis Khan (r. 1206–1227) in the North of Jin as the Hunter benefiting from the dueling. (“Northern Jin (1115–1234) – Southern Song (1127–1279) time” in Vietnamese = Thời Bắc Kim (1115–1234) – Nam Tống (1127–1279); với chuyện Nhạc Phi-Tần Cổi). In 1211 an enormous Mongol army conquered Jin and its neighbor Western Xia. The Mongols were allied with the Song (practicing Allying to Distant Powers to Subjugate Immediate Neighbours.). 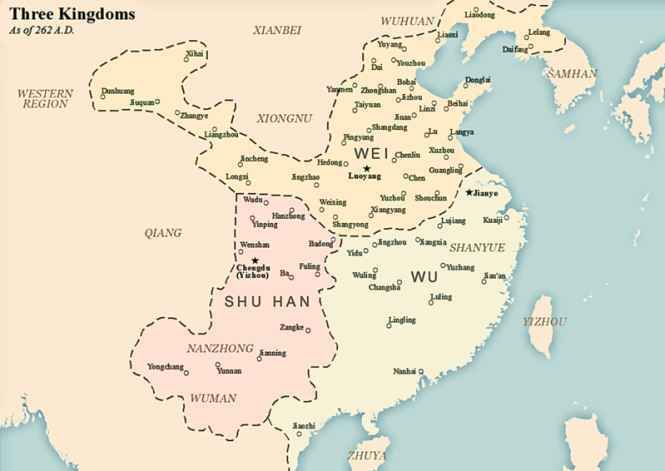 At the collapse of the Jin dynasty, the Song recaptured the former imperial capitals of Kaifeng, Luoyang, and Chang’an. Thereafter the alliance was broken. The Mongol leader Möngke Khan led a campaign against the Song in 1259 but died on August 11. There were minor border skirmishes until 1265, when Kublai won a significant battle in Sichuan. In 1275, a Song force of 130,000 troops was defeated by Kublai’s force. 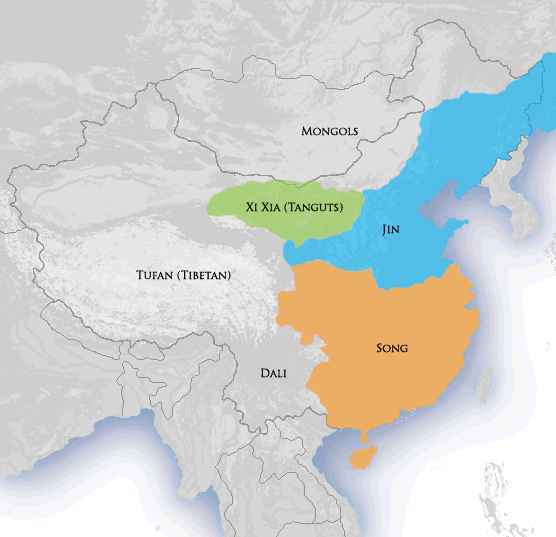 By 1276, most of the Song territory had been captured by Kublai’s forces. So the Mongols had played the role of the Hunter against the Two Dueling Tigers Jin and Southern Song. c. During the short war between two communist leaders [5,6,7,8], The Soviet Union (USSR) and China in 1968, the US had conserved its energy and let USSR and China played as two Dueling Tigers. US President Nixon did threaten USSR that US would not stand idling if USSR started to attack the Nuclear Capability of its opponent China. The threat by Nixon had denied the Soviet Union its only advantage over China, denying it the chance to walk over China and consequential claim to be the Sole Leader of the Communist Nations. The US has cleverly played the role of the beneficiary Hunter (although at the expense of its South Vietnam ally). Both the Soviet Union and China got exhausted. The USSR was so exhausted that it could not crush the Taliban taking on its neighbor Afghanistan. China had to pretend to be the “NATO like Ally on the East for the US”. Nixon and Kissinger visited China and two weeks after that China militarily overran the Paracel Islands of South Vietnam, securing its current strategic advantage and establish its modus operandi for expansion on the seas. Both Iran and Iraq wanted to be the leader in the Middle East . US sold advanced weapons to both Iran (F14 Tomcats fighters and an Aircraft Carrier in negotiation) and Iraq (with less advanced fighter aircrafts). The deadly war between these two oil-rich countries (both with Islamic populations) is just like the Dueling between Two Tigers. The beneficiary Hunter is obviously the US and the Western Allies.
. Paul Craig Roberts. “What is Henry Kissinger Up To?” Institute for Political Economy (December 28, 2016). TRUMAN WANTED TO PLAY THIS GAME DURING WW2: Harry Truman is the man saying that “if we see that Germany is winning, we ought to help Russia, and if Russia is winning, we ought to help Germany, and that way let them kill as many as possible.” but he could not influence FD Roosevelt.